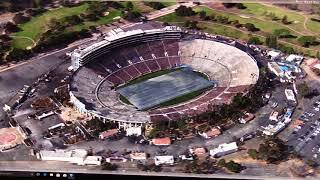 The USC Institute for Creative Technologies, a US Army University Affiliated Research Center and part of the Army Research Lab, recently collaborated with the Department of Homeland Security to create a 3D reconstruction of the Rose Bowl. They launched commercial, off-the-shelf drones on autonomous imagery collection flights. This imagery — thousands of high-resolution still photographs — was then fed into commercial photogrammetry software to build the 3D model. The Department of Homeland Security will use the photo-realistic reconstruction for infrastructure protection and planning tasks. With the model, decision-makers can identify vulnerable locations, locate optimal routes for security teams, or in cases of disaster response, determine where to emplace first responders and triage points. ICT’s ATLAS, the Aerial Terrain Line of sight Analysis System, allows users to visualize sight-lines and plan tactical movements on and around the reconstructed structure. Learn more about USC ICT at http://ict.usc.edu.